Participate in the “Monday Window” weekly post. Sharpen your photography skills, blogging techniques, and enjoy what others do on the same topic. You will find it fun and inspiring. Click the “button” for more information. Follow the tag “Monday Window“. Get a sneak peek at my collection. 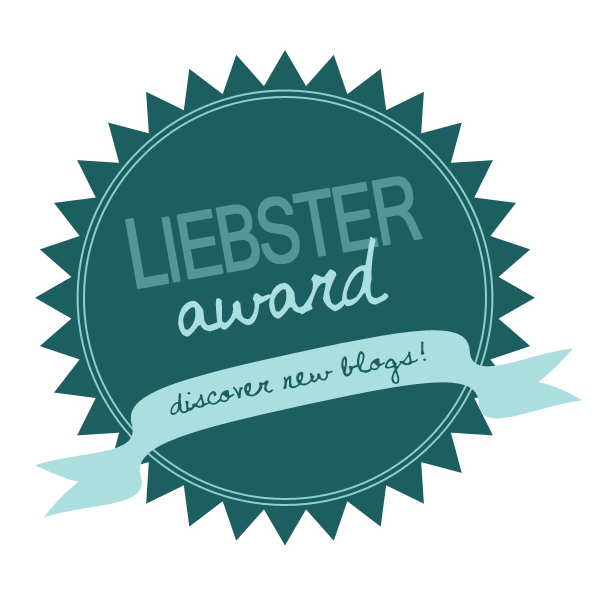 To my great surprise, this blog was nominated for the “Liebster Award” an award that is passed from blogger to blogger in order to help readers find new blogs to follow and for bloggers new to the community to expand their reach. The nomination came from a new-found fellow blogger friend who participated with me in a Blogging 101 training session. My award came from Irmgard Rahn and her mostly German language blog BOOKS OF REALITY. She received the nomination from a fellow Blogging 101 participant and describes the award in her post Mein liebster Award. 2. Answer 10 questions that the blogger gives you. 3. Give 10 random facts about yourself. 4. Nominate 10 blogs with under 200 followers. 5. Notify the bloggers that you have nominated them. 6. Give them 10 questions to answer. The first rule is satisfied above. Never one to follow the expected path, the next two rules, to answer the tem questions posed and to present tem random facts, I answer in my blog Ludwig’s Ramblings. This blog, Café Ludwig, has not been my place for many personal chats. I used the newly launched Ludwig’s Ramblings for interactions and assigned tasks in the Blogging 101 course. It seems fitting to me to make it part of my Liebster Award response, so go there for my answers and tidbits. For my nominees I have also chosen from Blogging 101 colleagues. I found the blogs that I have nominated above to be delightful, pleasant and interesting. I hope that you, my dear reader, will visit them and enjoy these blogs. They may not yet be the most polished in many ways, but I am sure you will find them “a good read”. How long does it take you from the moment an idea pops up to pushing the Publish button? How much time do you spend online in a typical week? What other passions do you have besides blogging? What do you value in blogs you read? How often do you carry a camera with you? Are pictures more or less important than the story in your posts? Do you have more than one blog? Have you bought any art from an individual artist online? What means do you use to follow blogs, computer, tablet, smartphone? This being a photography related blog, it would be unseemly to not include a photo. How about just a close-up of a tag? This one even leads you to yet another blog of mine if you just click the image. Storing images for pictures in blog posts in OneDrive makes it easy to link back to the source album. In my blogs Gallery Ludwig and Silver Canvas I have been doing that for many years. Microsoft has made a lot of changes in that time. The Microsoft “cloud” depository started with Live Spaces, became SkyDrive and more recently OneDrive. In that time links in blog posts to photos remained intact. Even when the folders were moved around and reorganized. A very nice feature and very considerate and useful service by the Microsoft team. The surround was a pleasant black, there was an information panel at the right and a line of thumbnails of other pictures in the album at the bottom. You could click the image to present it in a nice “light box” view – just the image, nice and large. Click the image to be taken to my OneDrive album “Silver Canvas” with this image in a large light box view. When you move the pointer into the window, links and other information will surround the image. In the lower right corner there is an “i-link” – see the red arrow in the illustration here. Click the “information” icon and the data for the picture will be displayed. Slide shows go full screen, not just full browser window, but full monitor. That is very nice. NOTE: The images in my blog posts are scaled to 1024px so you will not get the full effect on a high resolution monitor. This change affects not only this and new posts, but works just as beautifully for all earlier posts. You can see the whole album by clicking “View folder” in the top menu bar. The pictures are nicely arranged in their correct proportions. But Wait, there’s more! Hold down the Ctrl key and roll your mouse wheel. The display scales as you would expect in a browser window, but here the thumbnails are scaled and rearranged to fit the browser window. 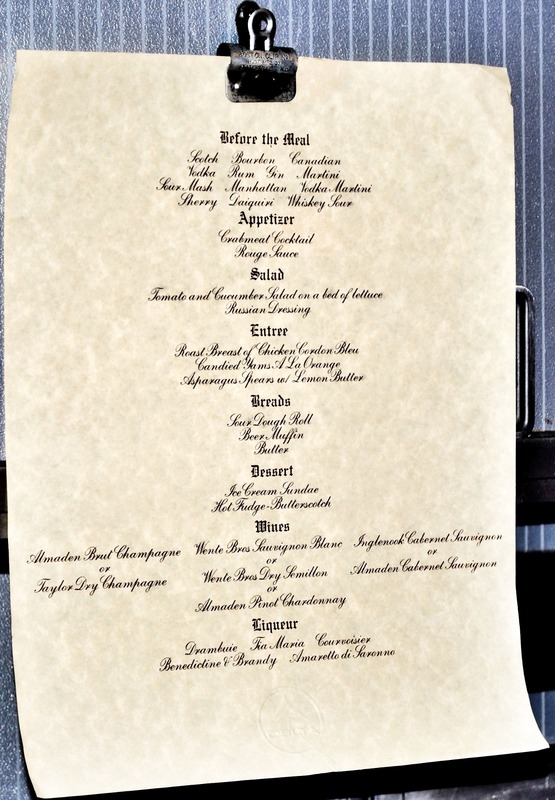 Really, really nice! One very nice improvement in the development of OneDrive. Thank you friends at Microsoft! 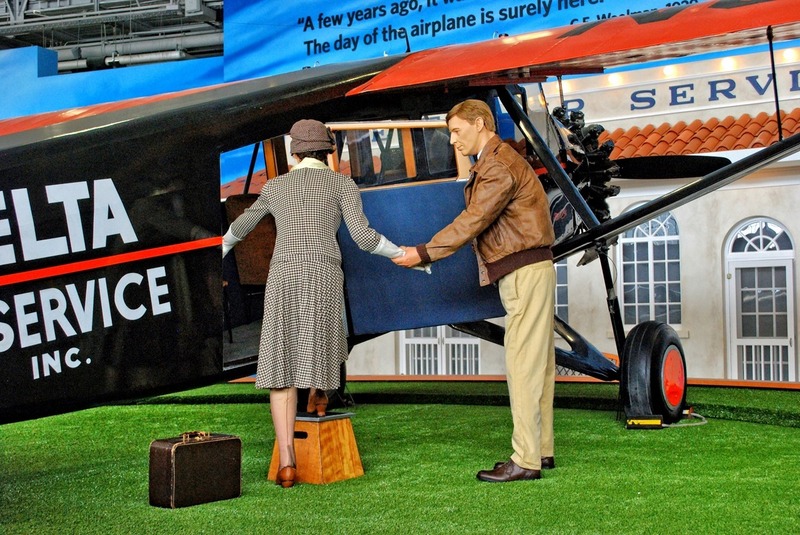 Delta Airlines recently opened the Delta Flight Museum to the public. 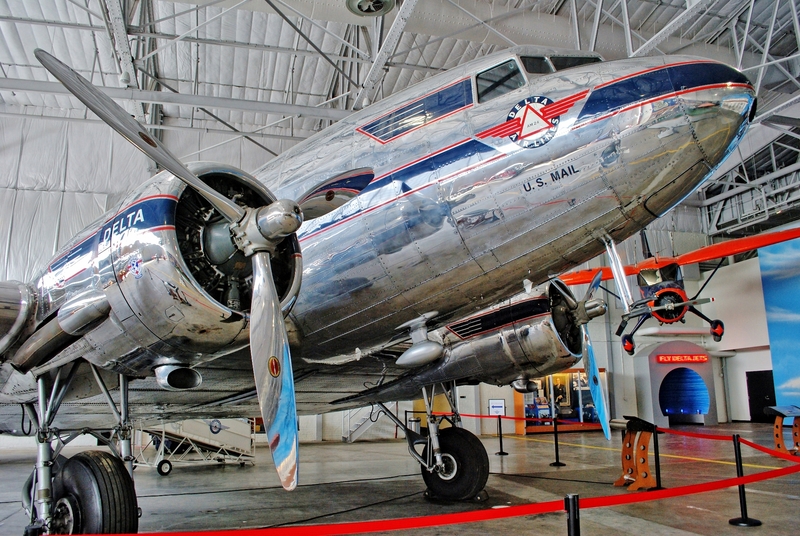 The museum is located in two historic hangars, now on the Delta Airline corporate campus. A most interesting place to visit. My visit there also provided me with some additional thoughts and tips on museum photography to go along with my earlier article, Museum Photography. The Delta Flight Museum is housed in two connected maintenance hangars dating from the 1940s. These historic hangars are now located on the Delta corporate campus adjoining the Hartsfield-Jackson Atlanta International Airport. When you visit, be prepared to show ids at the security gate. Unlike most museum artifact, aircraft are rather large. This makes getting them into pictures difficult unless you have a very wide-angle lens. I stitch photos together. Photo Gallery does a fine job of that. Microsoft Image Composite Editor (ICE) does a superb job. I use both. ICE is especially handy when some perspective correction also needs to be done. 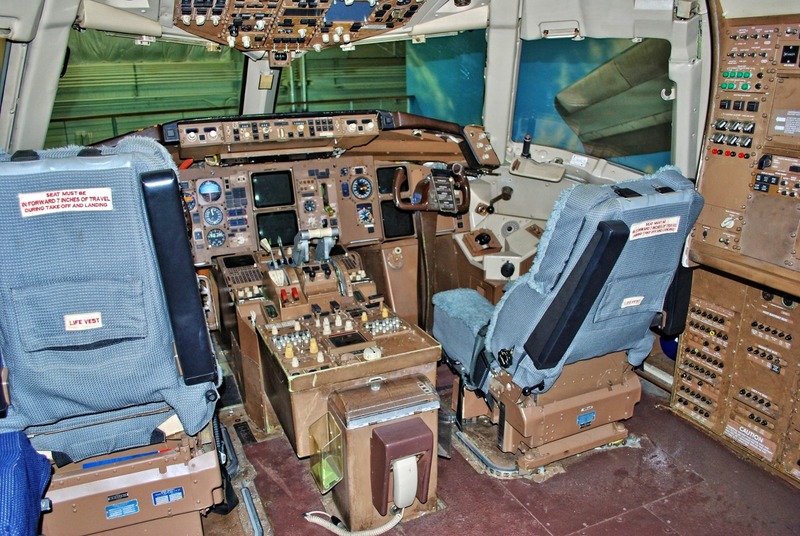 The largest item inside the museum is a Boing 767 aircraft. Inside the rear portion has been converted into an exhibit area with display cases along the sides. The Spirit of Delta – Boing 767 aircraft purchased for Delta by its employees, retirees, and friends in the financially difficult times in 1982. 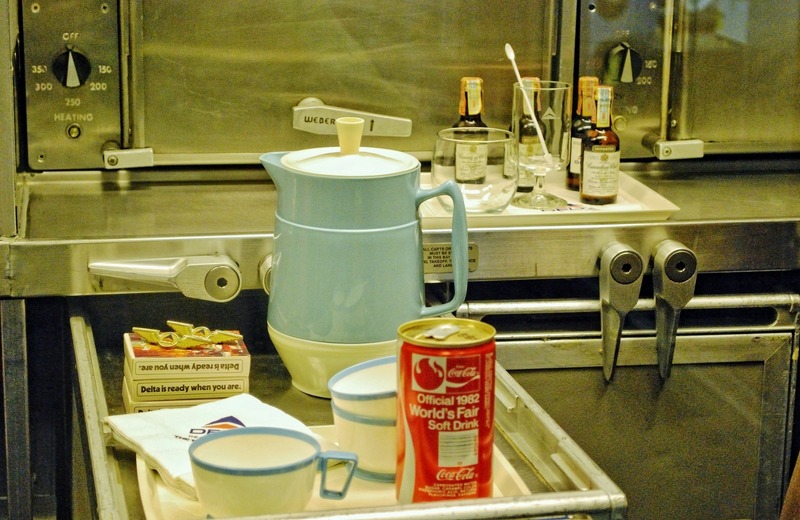 A number of items, like luggage carts, have been turned into display cases and there are numerous interactive displays giving information about the artifacts and the history of flight. The Delta Flight Museum, like other museums, is illuminated for a pleasant experince by visitors not for cameras. The light requires high ISO settings and the techniques of noise reduction described in the earlier article. 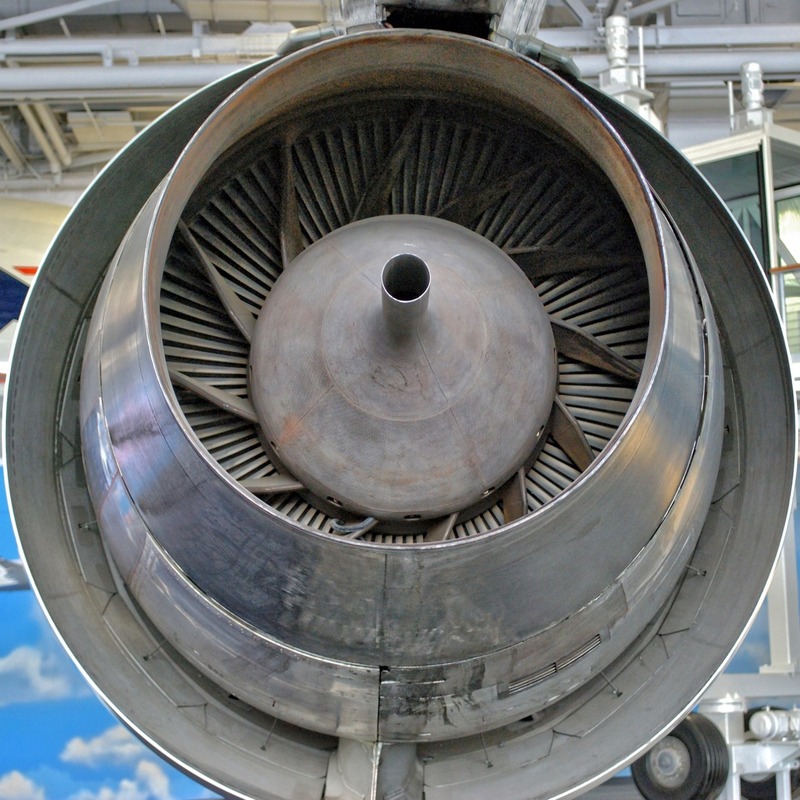 The high contrast range, illustrated here by the view into the “business end” of an aircraft engine and the cockpit, requires HDR processing. That technique was also covered in the prior post. For the images here I used primarily the “shadows” slider in Photo Gallery and the HDR effect in onOne Perfect Effects 8. 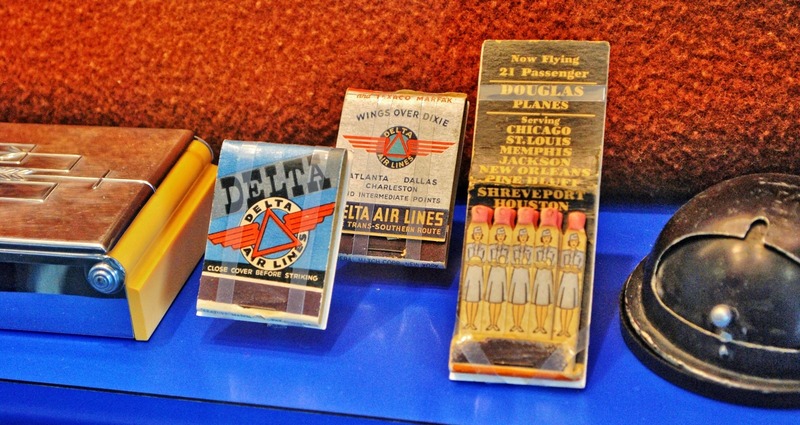 The many historical items take the visitor back to the early days of Delta, indeed to the early days of passenger flight. 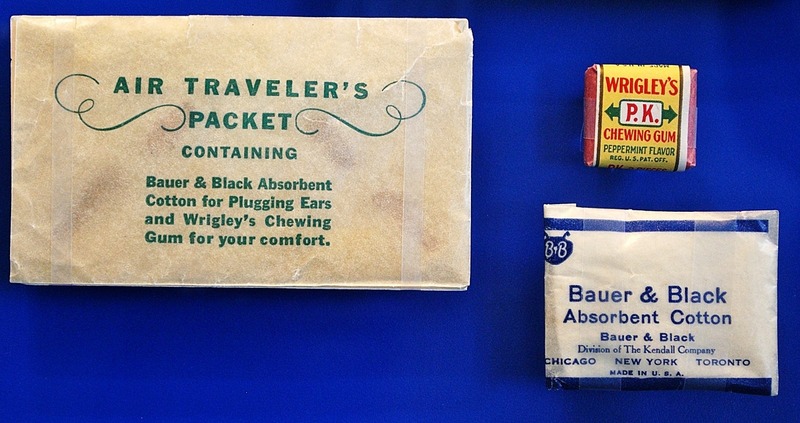 There are many interesting artifacts like the early “amenity kit”. 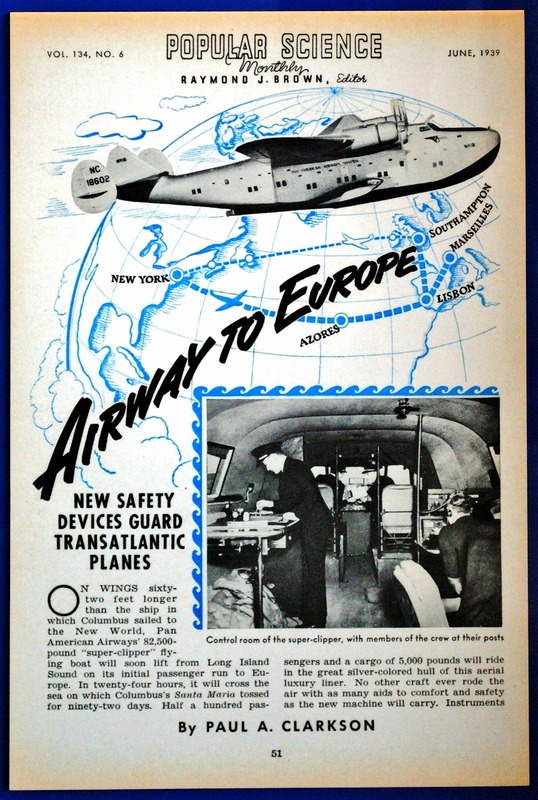 Yes, indeed, there was a time when smoking was common in airplanes. Early day customer being assisted in boarding flight. 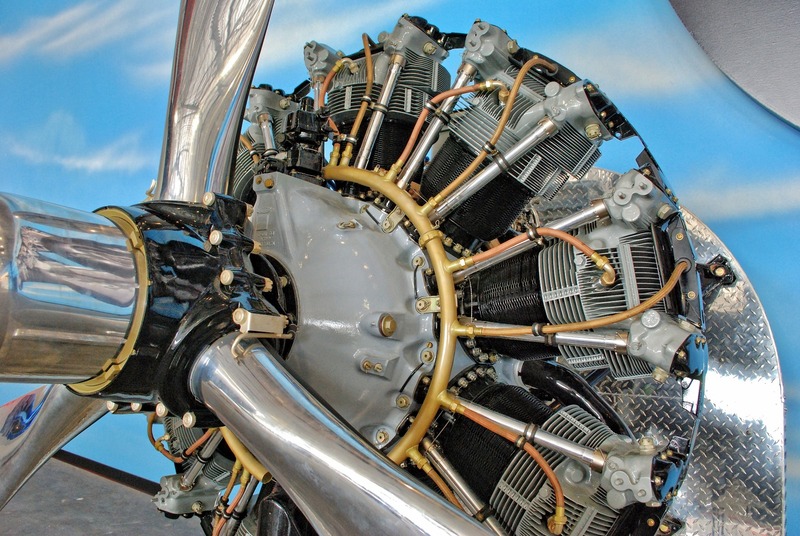 Tableau at the Delta Flight Museum. When we look at what flying was like some 85 years ago when Delta got started in the passenger business, we smile at how plain and simple it all was. The equipment was outright crude, and so was the merchandising and the service. Even I remember those simple days of flying. On my first flight on a DC-3 when we arrived at our destination the pilot hopped out, unlocked the door to the terminal and came back and unloaded the luggage. 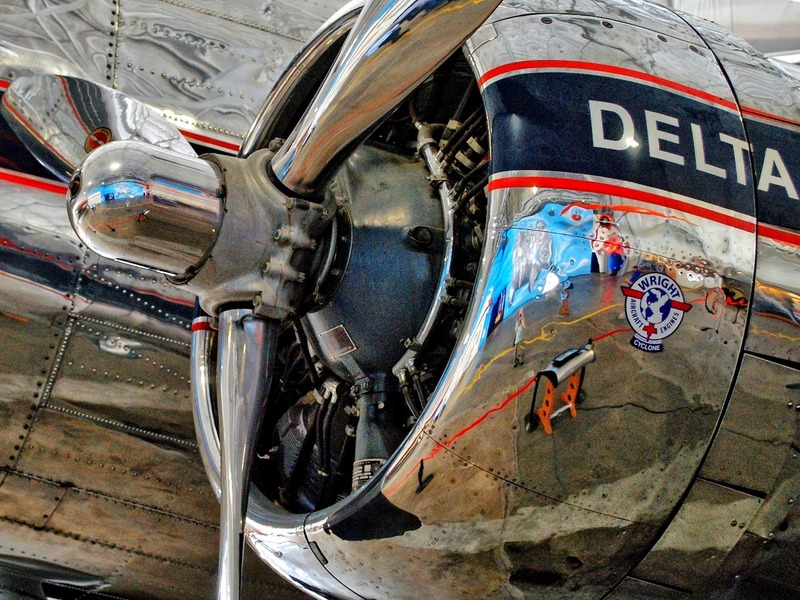 The Delta Flight Museum has the first Delta DC-3, now beautifully restored. Of course, I couldn’t resist this opportunity for a “selfie” in the polished metal of the DC-3. The Delta Flight Museum is still a work in progress. There are several aircraft outside the hangars that have not (yet) been integrated into the museum experience for visitors. Photography is permitted “for personal use”. There is a museum shop, of course. Be sure to pick up a memento there. Thank you, dear readers, for visiting Cafe Ludwig throughout 2012. 600 people reached the top of Mt. Everest in 2012. This blog got about 7,400 views in 2012. If every person who reached the top of Mt. Everest viewed this blog, it would have taken 12 years to get that many views.